In medium bowl, place 1 1/2 cups flour; add salt and pepper. In another bowl, beat eggs with whisk or fork. Coat chicken with flour, then dip in eggs and again in flour. In large skillet, melt 2 tablespoons of the butter over medium heat. Cook chicken in butter about 8 minutes, turning once, until no longer pink in center. Remove chicken from skillet; cover to keep warm. Add remaining 2 tablespoons butter to hot skillet; stir in 2 tablespoons flour with whisk until smooth. In small bowl, mix broth and lemon juice. Slowly pour broth mixture into butter mixture, stirring constantly with whisk. Return chicken to skillet, turning to coat with sauce. Cook about 2 minutes until sauce is thickened and chicken is hot. 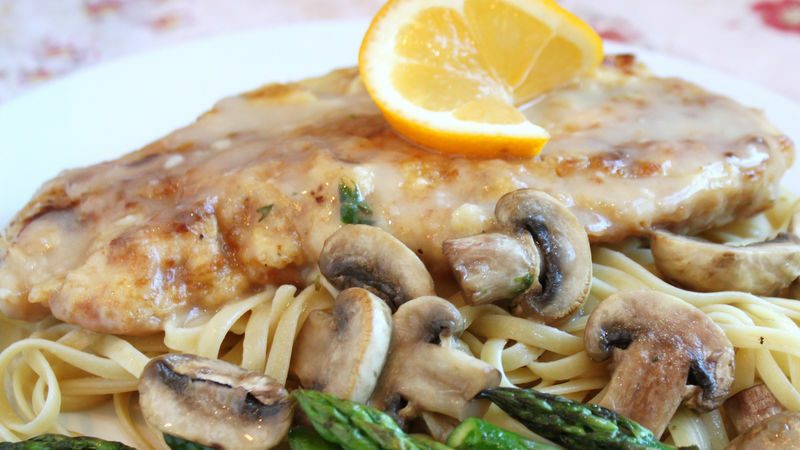 Serve chicken and sauce over linguine. Use 1/2 cup white wine for 1/2 cup of the chicken broth, if desired. Be sure to whisk continually while making the sauce to avoid lumps. The sauce can easily be doubled. Sautéed mushrooms and asparagus make a complementary side dish to this entrée.